Mini Candle Holders were made to hold a tea light. They are 2.25" square by 3.5" high. 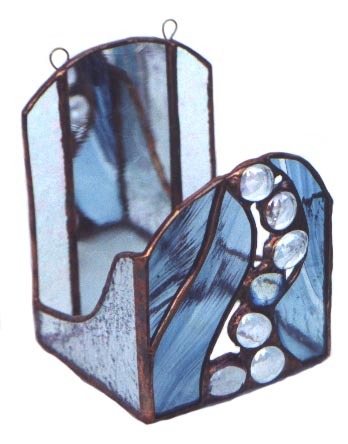 Jewel candle holders were designed to hold tea or votive candles. They have a mirror back and glass nuggets for added reflection. They are 4" wide by 3.5" deep by 5" high. 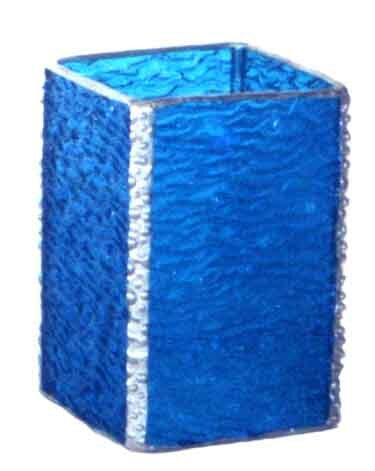 MINI CANDLE HOLDER GALLERY "Jewel Candle Holder"
Bevel and Faux Bevel candle holders were designed to hold tea or votive candles. The eight sided holder has either bevel or faux bevel corners which extend below the base of the candle holder to become the feet. They are 3" square by 6" high. 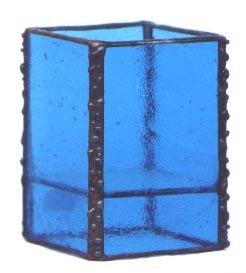 These wall and corner candle holders have a distinct castle like appearance and have wire rings for hanging on a wall. 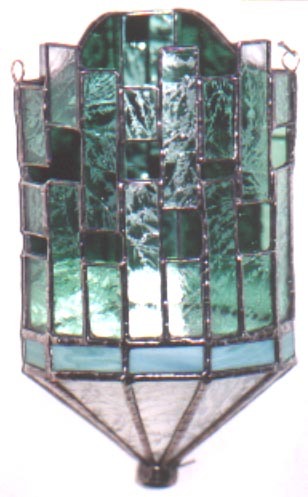 They come in various dimensions and are meant to hold tea or votive candles. 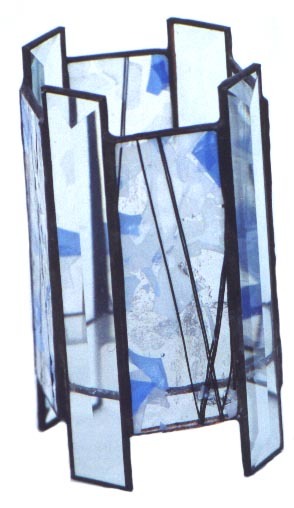 They have a colored mirror back which reflects the candle glow back through the positive and negative spaces.The front and cone shape below the base of the holder is semi-transparent clear glue chip glass with a glass nugget accent. BEVEL/FAUX CANDLE HOLDER GALLERY "Corner Candle Holder"
Stay tuned for more candle holders in the future.